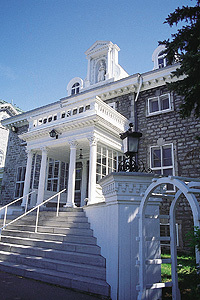 Villa Maria is a private co-ed school providing secondary education in French and English to more than 1550 students. Villa Maria’s mission is to uncover the full potential of every boy and girl, thanks to a personalized approach. Over its more than 160-year history, the School has acquired a solid reputation and the quality of its teaching is widely recognized. Classified as a historic monument in 1951, the building housing the School is located in enchanting surroundings and provides a stimulating environment fostering students’ growth and development.